A new winter snow brings both a blessing and a curse to a farm. The blessing is in how smooth and clean it makes everything look, how it dampens the clamor of work and of course what fun children will have. The curse is in the additional work it generates as depicted in the plowed lane. 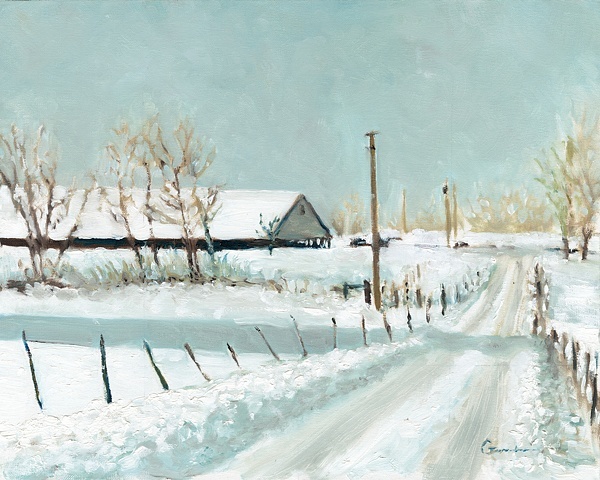 The dark brown fences, trees, and barn edges outline familiar shapes against a clear winter sky to depict the balance of blessings and curses common to farm life.